You travel in comfort aboard the M.V. Island Bay, which meets stringent Canadian Coast Guard safety requirements. 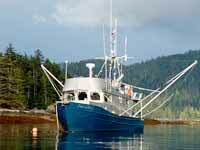 This vessel was constructed in 1979 specifically for Fisheries and Oceans charter patrol work. The boat has worked her entire career on the north coast monitoring and providing data for the management of a variety of fisheries. Constructed of aluminum with a teak interior, she's tough as nails on the outside but warm and comfortable on the inside. The main cabin is all above deck with lots of windows which provide great visibility even in inclement weather. 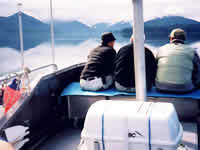 Her covered aft working deck is great for fishing,deploying kayaks as well as cruising. 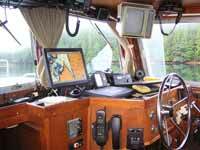 The top deck with flying bridge is a fabulous place for wildlife viewing, photography and relaxing while underway.